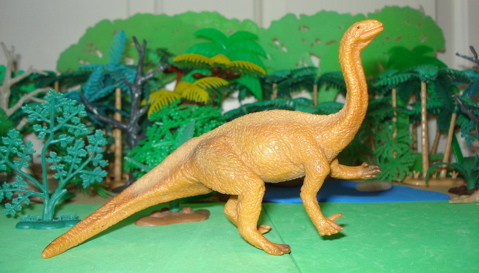 Dinosaur movies Dinosaur toys blog archive. 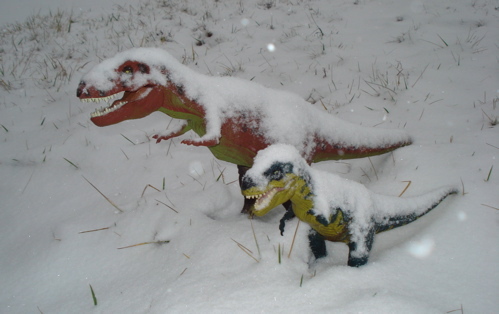 Dinosaur Movies in the Snow? We Couldn't take any Dinosaur movies. 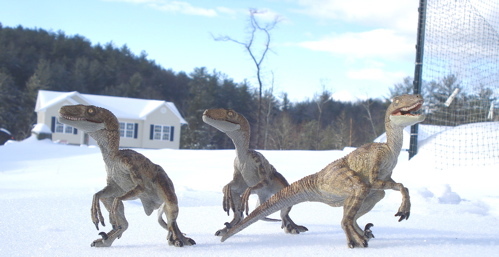 Today we completed the last of our Plateosaurus pages (as promised) and it SNOWED for the first time in two years at least!! We'll get to that shortly. "I feel like the president with my bodyguards." "Perhaps, after lunch, I'll conquer the world." Dinosaur movies are always fashionable. 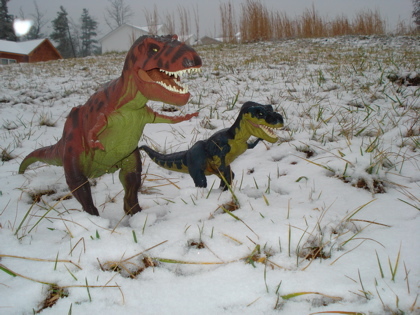 Upon seeing it snowing Rexford and his daughter, Rexie, decided to go out and play. 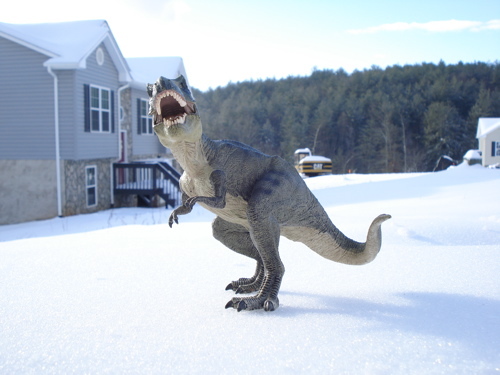 Now Tyrannosaurus Rex's arms are too short to make snowmen or snowballs so playing in the snow is limited to pretty much just standing around. To each his (and her) own. "Boy Dad, this is fun!" "Yes Rexie, it sure is." "Is this a heavy snow Dad?" "How long have we been out Dad?" "About an hour honey. Getting cold?" "Do you want to go in honey?" "So. 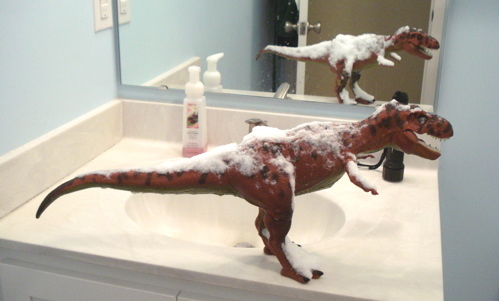 How do you like your first snow, Rexie?" 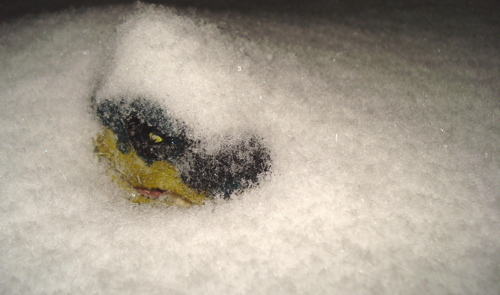 "I think I'm ready to go in now...."
"Tell Mom I'll be in shortly, Rexie." 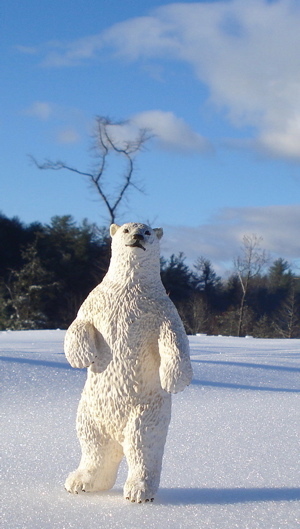 "Brrrr. 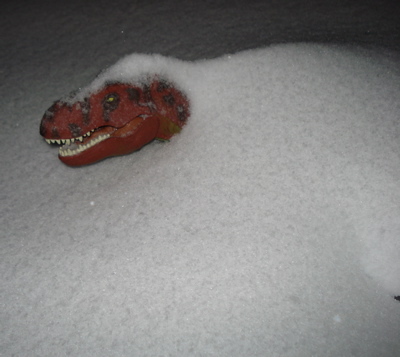 Dad said he'd be right in but it's getting awfully deep out there...."
Will it get too deep out there? 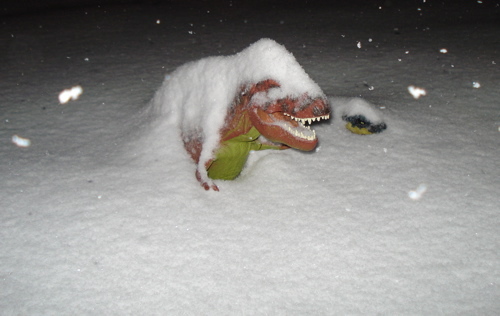 Will Rexford make it back inside? Check with us tomorrow, same Dino-time same Dino-channel, to find out. Tomorrow? Send out the St. Bernards. 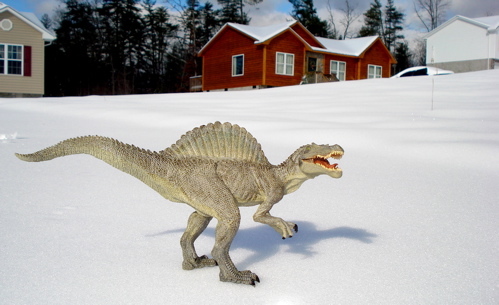 Curled up in front of the fire... watching Dinosaur movies. 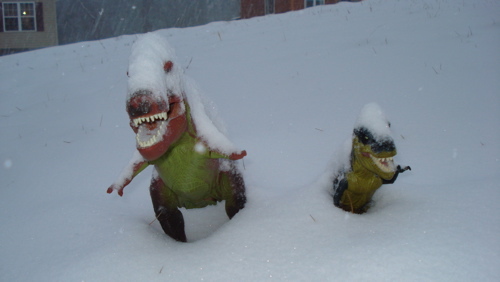 Snowed in and can't go out to see Dinosaur movies. 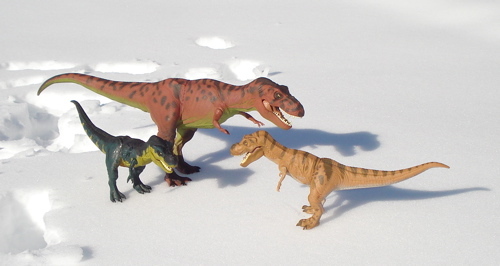 When last we saw (some of) Rexford he was out in the snow with Rexie. She decided that enough is enough and came inside (see yesterday's blog) but Rexford, brave and true decided to see what he might learn from staying out just a little bit longer. 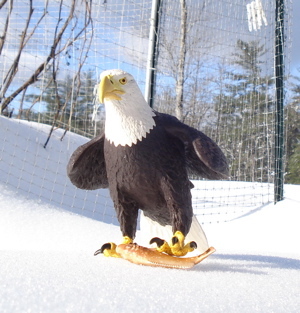 This is, after all, his first real snowfall. 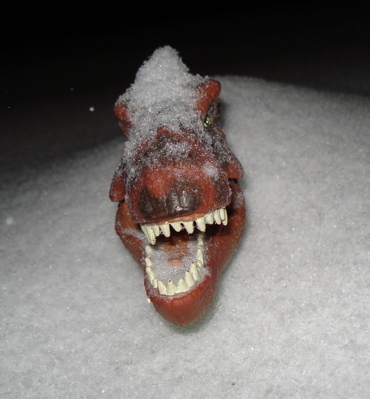 Well, Rexford's education in snow earns him a p.h.d. (piled higher and deeper) and it has become clear that drifting in the snow is the be-all and end-all to what he will accomplish. 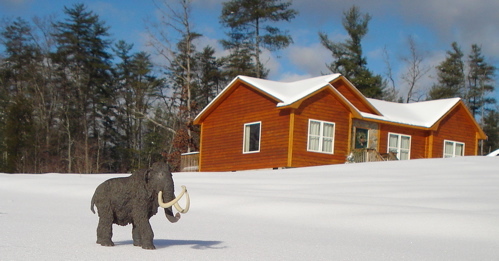 The adventure continues the next day when Rexford rises to lots of activity. 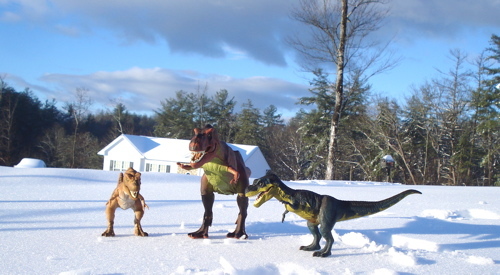 All the neighbors seem to be out enjoying what is hopefully just the first snow of the year. "Don't be looking at me there Mr Overbite!" "I dunno, waddya wanna do Moe?" "Nothin', Curly. Wadda you wanna do?" 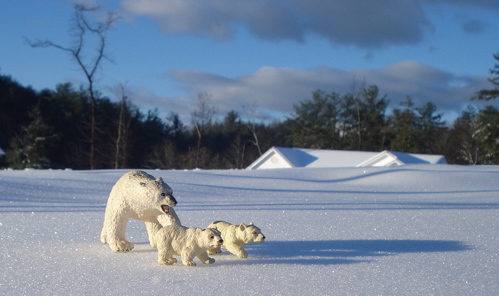 And so as the sun slowly sinks in the West Rexford gathers his children, Rexie and Junior, to return home. "What a beautiful day it's been kids...."
"Okay cubs, time to go back to our Den Sweet Den." "We gotta move kids. 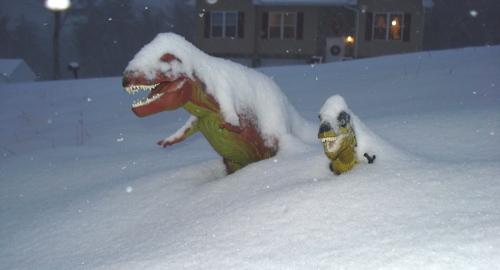 Whole danged neighborhood's gone to the Dinos!" Maybe we can watch Dinosaur movies on television. 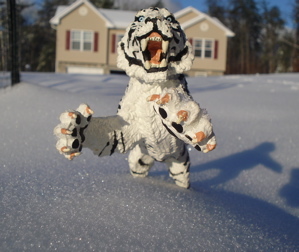 On the second snow day more neighbors were seen and we are presenting some more pix of them. Not everybody wanted their pictures taken (left) but, in general, almost nobody seemed to mind. It was sunny and bright and really beautiful, temperatures in the mid-thirties. "Get outta my face. I'll autograph you!" 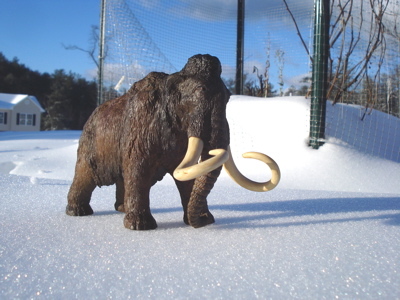 "I'm looking forward to ice-fishing. There's plenty out here." "I'm going to get in some hiking." "I'm hoping to get in some hiker... or hiking... whatever." Others were clearly well prepared for playing outside today. 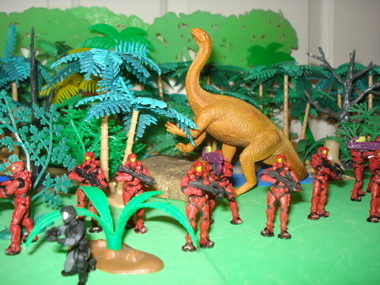 "Be careful cubs, there are Dinosaurs about." There were those who seemed to be just standing around (Right). But it turns out they were just being watchful. "No body messes with my cubs. Not unless they want to end up with real sores!" "Now be careful kids. 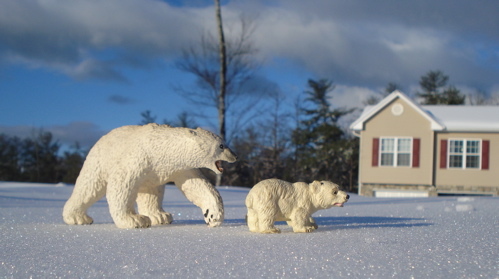 There are bears about." 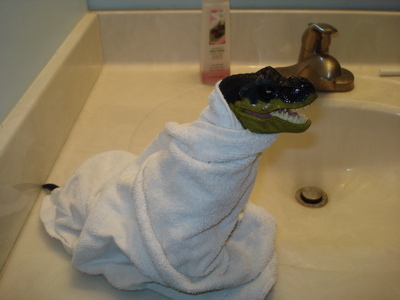 Are there any Dinosaur movies on T.V.? 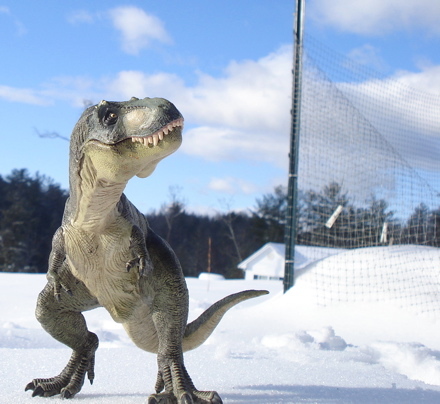 Perhaps to a Dinosaur movies don't really matter? Dinosaur Movies aren't here at all. 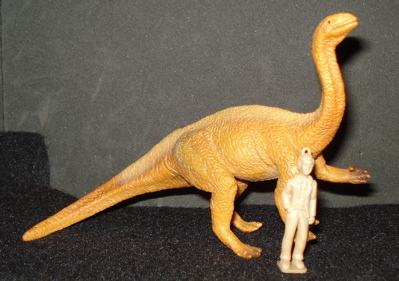 You have been reading the Dinosaur movies page of the Dinosaur Toys Blog Archive. Click here to return to the main archive page. Find Dinosaur movies at your local video store.